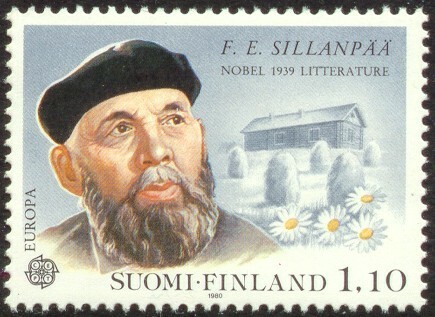 Finnish novelist Frans Eemil Sillanpää received the Nobel Prize in literature in 1939. Sillanpää gained international recognition with the naturalistic novel from the bloody Finnish civil war of 1918, Hurskas Kurjuss (1919: Meek Heritage). His following novels are characterized by a more poetic mood. They are set in the countryside, and the narrative, often focusing on love and sexuality as the ruling forces of human life, is framed by sensitive descriptions of nature. These dry sticks and twigs up in the chimney vault were really true treasures on a winter’s morning; they were almost like edible delicacies. When you put them on the hearth under the trivet, they caught fire at once, and with their help you could then also get the damp firewood smoldering. And the coffee simmered, its fragrance filling the room, which was warmed bit by bit. The windowpanes, which just now were coated with a thick crust of ice, were already beginning to thaw on their uppermost edges; while the coffee was settling Mina could peer through the thawed-out spots to the yard, where a reddish-yellow December morning had just dawned. From the farms the smoke was rising straight up to the sky, and she thought she heard the crunch of sleigh runners. Now look how long I’ve slept.—Well, and then it’s Christmas Even, too, by golly!—Up with you in a hurry lass! From under the covers two little eyes were opened and aimed at the room and at Mina, whose familiar features quickly dispelled the memory of the tangled splendors of the child’s dreams. The blazing fire in the fireplace, the frozen windowpanes, and the confidently puttering old woman gave the child’s mind full compensation, auguring a long, clear day with thousands of adventures.